Ask the Tarot is powered by Flash and may take a moment for the images to load. If you're using a mobile device you may need to click on the grey area below to activate Flash. The cards are constantly being shuffled as the wheel turns, so clear your mind and focus upon your question, then click on a Tarot card and the answer will be revealed. 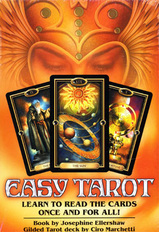 © Easy Tarot: Learn to Read the Cards Once and For All! Available from bookshops, Llewellyn, Amazon.com, & UK. All rights reserved. Copyrighted material displayed with permission of Llewellyn.